The Lehmann Black Cube Phono Stage is where it all started back in 1995, Norbert Lehmann's first product was the Black Cube. Seen as a reference point by many Audiophiles and Manufacturers alike, the Cube was eventually modified to 2006 specification and, once again, leads the field of mid priced Phono Pre Amplification. 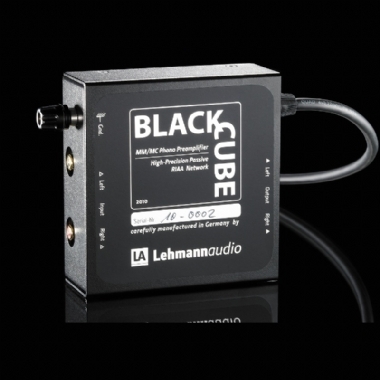 The Black Cube is produced in small numbers and sonically superior to mass industry products. The Lehmann audio Black Cube phono stage is compatible with practically all available cartridges on the market from High Output MM to MC. Apart from the standard switch settings there is one onboard slot that can be fitted with a custom impedance to supply perfect termination even for the most exotic cartridges. No more need for expensive impedance plugs! The input stages used in the Black Cube can also be found in top notch mixing consoles or in well known professional microphone preamps. The entirely passive RIAA equalization network is realized with high precision foil capacitors. All resistors are of the low noise metal film variety. The switches for gain and load settings have gold plated contects. Because of the small outer dimensions the Black Cube can be placed next to the turntable. This minimizes loss due to cable lengths. The low noise regulated external power supply is connected permanently to the audio section to minimize the number of contacts in the signal path. Lehmann audio always pays special attention to details: the cable between power supply and audio section is shielded. The cases of both the power supply and the audio section are made of nonmagnetic materials and the case of the audio section is even equipped with a top cover coated with a special anti-resonance treatment.